I’ve had a dry couple of days (apart from presenting a tasting to some beautiful young yacht crew), in advance of an anticipated weekend of wine enjoyment. I have been drinking tea! Tomorrow, with some friends I will be visiting Domaine Trevallon in the morning and Château d’Esclans in the afternoon, punctuated by lunch at L'Oustau de Baumanière. Which I don’t know, but has 2 Michelin Stars, so the expectations are high! It is definitely worth visiting the Bonny Doon website, where you can while away a few hours in the Dooniverse of the great, erudite and witty Randall Grahm. 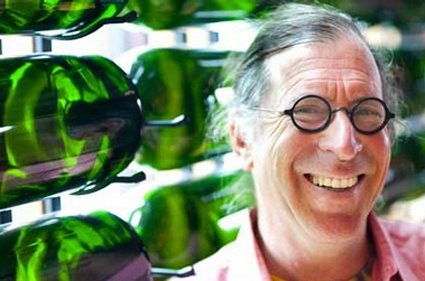 I know Randall a little, having stayed with him many years ago on my first trip to California and once having designed a label for him (‘Punk Carignane’. It was before the internet and neither I, nor the web, have a photograph of it, although I do still have a bottle somewhere. Which I am sure needs drinking by now.) Randall was one of the first Rhône Rangers in California, based just outside Santa Cruz (home of the oldest wooden rollercoaster in the States, and where the Lost Boys was filmed). He crafted, and still makes, lots of different and exotic wines from anything but the ubiquitous Chardonnay, Cabernet and Merlot that proliferated throughout California then. And do still, although to a lesser degree. Cigare Volant is his flagship red (there is also a white called ‘Le Cigare Blanc’). It’s a blend of Grenache, Syrah and Mourvèdre with a hint of Cinsault, the same blend of grapes that is usually found in France’s Châteauneuf-du-Pape (although up to thirteen varieties are permitted there, and only Grenache is essential). The wine is similar in style, although that isn’t saying much because Châteauneuf can run from the dusty and near fruitless with earthy flavours abounding, right the way to juicy, fresh and explosively fruity with sweet new oak. In truth Randall’s wine is somewhere in between with plenty of forest fruit but hints of dry spices, herbs, coffee and just a touch of savoury gaminess. Delicious. Châteauneuf-du-Pape was one of the first Appellations in France in 1923. Named after the ‘new castle of the Pope’ in Avignon, until the 1920s the wine’s reputation was under threat from fraudsters who would pass off different wines under the name (plus ça change!) In 1954, with the world awash with fantasies of invasions of little green men, a statute was added to the Châteauneuf rules which – quite specifically – forbade and forbids spaceships from landing in the vineyards and ruining the grapes. The rules dictated exactly what would happen, including impounding of the trespassing flying saucer. 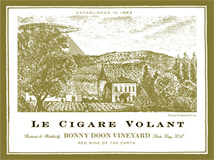 Randall discovered this bizarre story and this is the origin of the name and label of his wine "Cigare Volant" - 'flying cigar' being the French expression for a UFO. In fairness, no spacecraft ever has landed in the vineyards of Châteauneuf-du-Pape, so the aliens must all live in as much fear of French regulations as the rest of us do. But I’m sure Will “welcome to Earth” Smith would be there in a flash to save us if ever they dared.